When, Los Angeles design duo, Joe Lucas and Parrish Chilcoat first met they quickly bonded over their East Coast roots. 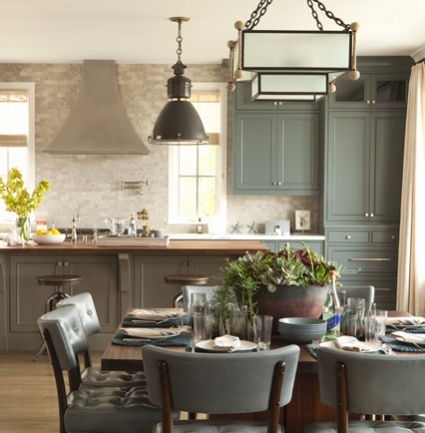 After working side by side in the design department of Michael Smith, it wasn't long before the two realized that their aesthetic, while mired in the traditional elegance one associates with the East Coast, was far from formal and stuffy but exuded the freshness of California hip, all the while staying completely elegant. 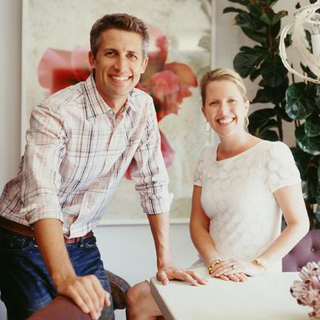 In 2005 the two opened the West Hollywood design firm, Lucas Studio. Located in Almont Yard, which was at that time the closest thing L.A. had to an design 'colony'- housing other top notch designers such as Kathryn Ireland, Nathan Turner and Peter Dunham. Within 3 years, the two expanded by opening their showroom, Harbinger. As the team's success and business flourished, they knew it was time to step things up and expand. Their newly opened Harbinger showroom now sits along, L.A.'s premier design row on La Cienega. Come have a listen to the Joe and Parrish as they took some time from their busy schedule to talk to us about opening a new space (in what seems like record time), their thoughts on design and of course, how they got into the business. Nice post.. I am so glad to visit your site..
Another GREAT listen. The three of you have such a knack for making your guests feel so at home, and keeping the conversation lively! How fun are they?! No wonder they got hired without design experience. Attitude and confidence is everything in life, isn't it? I bet they never thought they couldn't do it. So inspiring. Megan, who did they say is the designer of the wallpaper you asked about? Isn't that done in fabric as well? Thanks for the delightful interview. I could cook in that kitchen, I could live in that kitchen, I do not ask for much. I wish you a great week. Thank you for sharing another interview with your listeners. I really, really wanted to love this one! Joe and Parrish are so talented and are obviously delightful people. But in my opinion, as interviews go, this one missed the mark, with too much time spent on the topic of their firm/showroom's location and the neighborhood . . . who is next door, who's around the corner, etc. You lost me after a while. Still, I'm a faithful listener and big fan and look forward to the next SRT! love these! 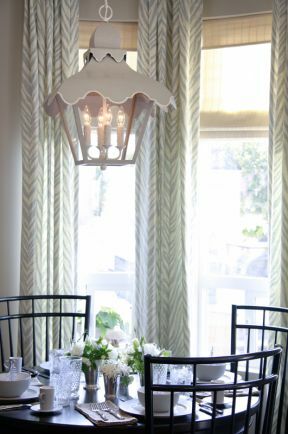 and love how they paired that colleen and co lantern with those curtains. thanks for the intw! Between 2009 and 2013, interior designers and design bloggers Megan Arquette from Beach Bungalow 8, Linda Merrill from ::Surroundings::, and Joni Webb from Cote de Texas discussed blogging and interior design on a weekly design podcast called The Skirted Roundtable (think the Algonquin Roundtable meets interior design). We had no idea what we were doing when we started - because we were the first doing a weekly podcast of this type! We started chatting amongst ourselves about our design and blogging experiences. Then we asked other bloggers whom we respected to join us and were thrilled when they did! Eventually, we had the opportunity to chat with some of the biggest names in the design industry - including many members of the AD100 and other "Top" lists. We also chatted with some up and comers who've since made their mark on their design world. All these podcasts, though a few years old, are evergreen. We chatted about their backgrounds, how they because designers and got their first clients and so much more. We thought of these freewheeling chats as "masterclasses" on interior design. All told, we recorded 101 podcasts which to date have been downloaded nearly 700,000 times! Enjoy! Thanks for continuing the conversation! If you've posted about The Skirted Roundtable or have written a post inspired by one of our conversations, please let us know so we can link to you and everyone can join in! Let's keep the conversation rolling! Interior Concepts by Wanda Confers to SRT a Stylish Blogger Award! Kitchen Perspectives: McAlpine, Lutyens, WOW! Just Joolz - Is Inspired by Jane Pollak! 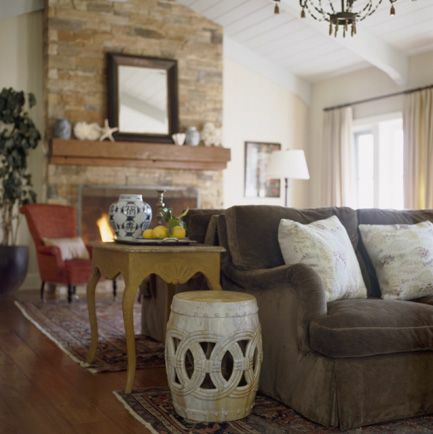 Styling by Coty Farquar - thanks for the mention! Doxa Home - Kreative Blogger Award to SRT - thanks! Liberty Post Editor: Now Hear This! Material Girls Blog: I'm Addicted! Color Me Happy: Should you pay for a room to be repainted if you chose the color?